Read the Key Verse with your class. Help them understand the verse using the following definitions. Today we will see the “secret” God had made with David many years earlier (that he would be king of Israel) come to pass. We also notice that David’s relationship with God was one of reverential fear. We see God show David that He will continue fulfilling His covenant with His people by establishing David as king. This was pivotal in ushering in Jesus, the King of Kings (I Timothy 6:14-15). Summary: Remember that we saw Saul became the first king of Israel, but had the kingdom removed from him and his family, forever, because of his disobedience to God’s words. I Samuel 15:23: “For rebellion is as the sin of witchcraft, and stubbornness is as iniquity and idolatry. Because thou hast rejected the word of the LORD, he hath also rejected thee from being king.” I Samuel closed with King Saul’s death in battle. We have now seen 3 of the 4 main characters in the books of Samuel have died. We begin the book of II Samuel continuing in the life of David. We open with David hearing the news, mourning, and Judah (one of the tribes of Israel – David’s tribe) anointing him as their king. The rest of the tribes accept Ishbosheth, Saul’s son, as their king. We see the nation in a state of conflict and turmoil as their king has died, and they try to go on. Until they receive David, God’s choice for their king, there is no peace in the land. Once David is established as king throughout Israel, they are prepared to move on as a nation. One idea for today’s lesson: (See picture below). For today’s lesson we made a crown as we remembered how God made David king of Israel. 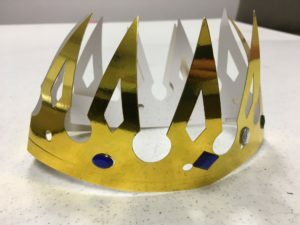 You could either purchase pre-made crowns through someplace like Oriental Trading or make your own with gold or silver poster board. Stick on jewels are the easiest to use to decorate the crowns. Some children are creative and enjoy coloring their own crowns with markers making their own jewels.